3-D Monster: Anyone Know How to Build a Website? My good buddy & promoter, Marty Webb, is looking for someone to build him a website. In exchange for this service, he is offering.... wait for it..... FREE ADVERTISING SPACE ON HIS BODY!! 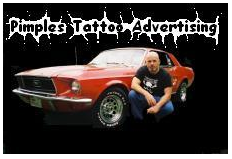 No, really - he will tattoo your logo to his body! The guy's a madman, what can you do? Anywho, if anyone out in internet land is interested in this once-in-a-lifetime opportunity, you can contact Marty Here.